It was some ten thousand years ago that the last ancestral Paleo-Indians were able to make the foot crossing from Asia into North America. Behind them the sea would have swallowed up the Bering land bridge as huge ice sheets reaching as far south as Manhattan Island melted and retreated. When these hardy souls were trudging through a tundra-like landscape clad in furs, past scraggily spruce, dwarf willow and shrubby birch, perhaps following a herd of wooly mammoths, the Florida peninsula was almost twice as wide as it is today. But as sea levels continued to rise, Florida slowly shrank to its current shoreline. As it did so, the world’s climate became warmer and wetter, with our Everglades and precious Fakahatchee Strand developing about 5,000 years later. For the past million years the Earth’s climate has alternated between warm interglacial periods of 10-20 thousand years and ice ages of some 80-90 thousand years. These climate oscillations correlate with what are called Milankovitch cycles. There are actually 3 different Milankovitch cycles at work, each with its own periodicity. They affect the shape of Earth’s orbit around the Sun from almost round to quite elliptical and therefore our distance from it, as well as the amount of tilt in Earth’s axis and the direction of that tilt. These all combine to vary the amount of solar energy Earth receives, which determines the advance and retreat of our glaciers. A common question posed by our visitors is: how do we know that current global warming isn’t just part of this natural cycle? The answer is that these natural changes occur extremely slowly over a 100,000 year timeframe. So if the warming was the result of the natural cycle it should have taken many thousands of years instead of just the few hundred since the industrial revolution. There’s another major difference, too: we know from ancient gases trapped in ice core samples that in prior interglacial warmings increases in CO2 levels lagged behind (followed) rises in temperature, which is what we would expect if the rise was from the natural Milankovitch cycles instead of from a rise in CO2. However, in our current warming the temperature rise is being led (preceded) by an increase in atmospheric concentrations of CO2. You may also hear people talk about fluctuations in solar output. In fact, over the past 35 years of global warming the sun has shown a slight cooling trend, so recent warming cannot be attributed to changes in the Sun’s radioactive forcing either. Our insulating blanket of greenhouse gases has a bigger climatic influence than any slight fluxes in incoming solar energy anyway. No skeptic has come up with a viable natural explanation for the magnitude of climate change that has occurred over the last few decades, whereas the unnatural answer of increased greenhouse gas emissions fits the bill. 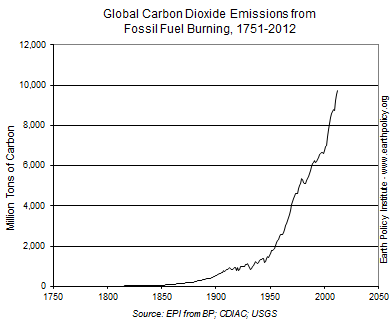 The physics of the greenhouse gas effect is beyond dispute. The final question we may have to answer is this. If we know that our planet has survived past warming episodes, why does it matter? Because our entire civilization – where we can live, where we can grow food, what food we can grow, where and whether we’ll have sufficient water, our biodiversity and whether there’ll still be an Everglades – is all dependent on the climate we have experienced for the past 10,000 years. We are now past the point of being able to stop change. We are just struggling to limit the amount and rate of change, so we and the natural world have time to adapt to it. And that’s just half of it. Right now we are being partially shielded from the full effects of our excess greenhouse gas emissions by the thermal inertia of our planet’s vast oceans. In a few decades we can really expect temperatures to take off.